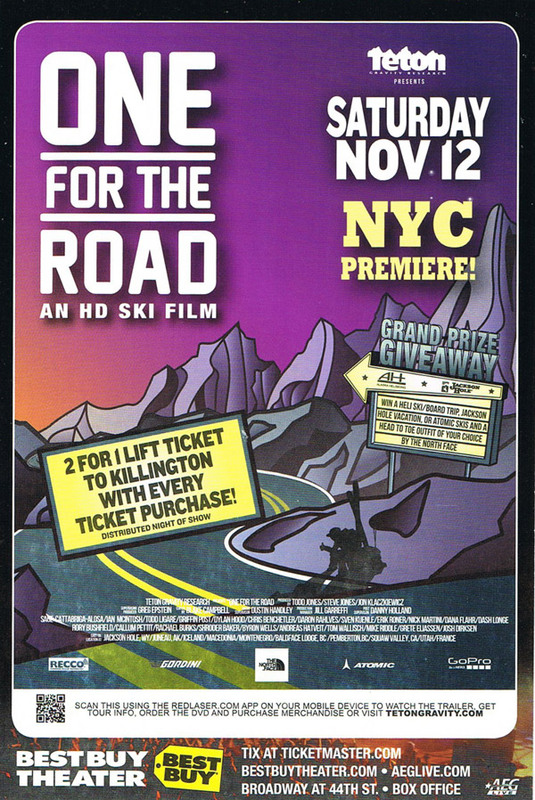 This Saturday November 12th, One For the Road will be shown at BestBuy Theater in Times Square. The HD Ski Film is the latest from Teton Gravity Research & athletes Sage Cattabriga-Alosa, Dana Flahr, Dylan Hood, Todd Ligare, Dash Longe and Ian McIntosh will be stopping by to show their support — and party, obviously. During the premiere you’ll have the chance to win Atomic skis, a new kit from the North Face, a vacation to Jackson Hole or the grand prize — a ski/board Heli trip!